Cattle-herding cultures are beginning to appear. 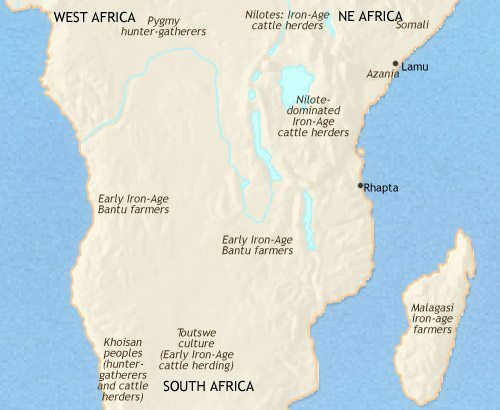 Bantu farmers had spread through the Congo forests, and then into southern and eastern Africa, at start of the Christian era; they had settled in small, scattered villages on lake shores and in river valleys, moist areas suited to their early iron-age farming technologies. Stone-age hunter-gatherer populations were still sizeable in central Africa in the first millennium CE. Cattle herding was uncommon in most of central Africa. Due to tsetse fly (fatal to cattle) it was limited to areas of open grasslands, such as those in the Great Rift Valley and the Serengeti plains. In the southern areas, however, the dry, open grasslands were ideal for cattle. 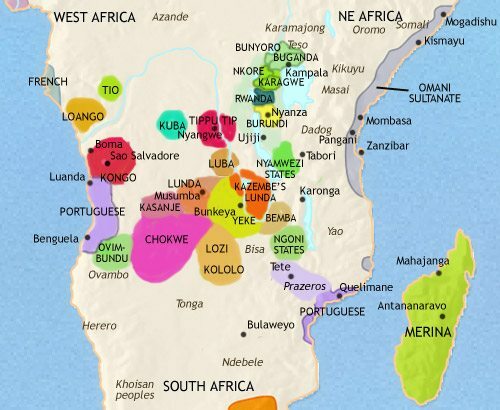 From 650 CE onwards a cattle herding culture, the Toutswe, has spread over a broad area. By this date, communities located along the shores of the Indian Ocean had long been in trade contact with the Middle East and India. Some important towns, such as Lamu and Rhapta, had grown up here. In east Africa, the clearing of forests by generations of farmers had by this date created more open landscapes, favouring a cattle herding lifestyle. 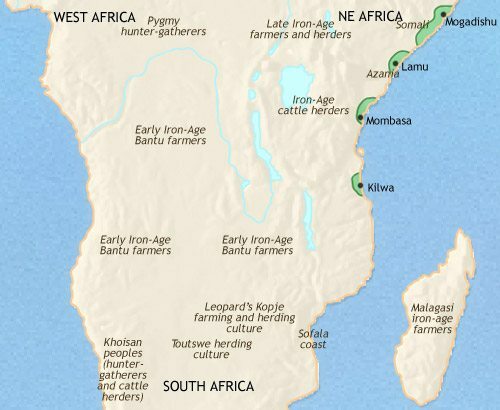 Pastoral peoples came in from southern Sudan and settled, probably as a ruling class, amongst Bantu farming populations in the Lake Victoria/Tanganyika region. The mixing of the two populations seems to have stimulated marked advances in technological development. 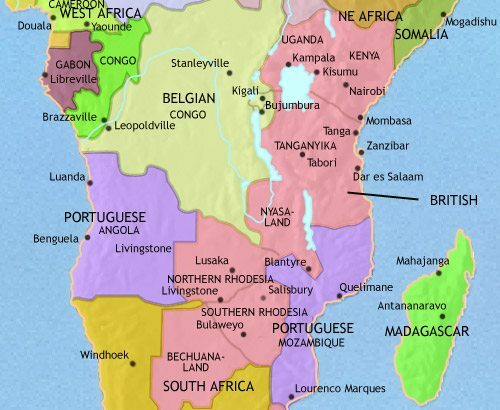 At the same time, more, and larger, towns became established along the Indian Ocean coast. These towns became home to a mixed Arab-African culture, later called “Swahili”. From them, trade routes spread further and further inland, bringing with them new ideas and techniques. Rippling out from the Lakes region, there are signs of late Iron-age culture, with new farming techniques (for example, terracing), more effective weapons for fishing, hunting and war, more sophisticated textiles and pottery, increased trade and greater class differentiation. Politically, this period sees the start of the formation of powerful chiefdoms, to be followed shortly by full-blown kingdoms. The trade routes radiating out from the coastal cities of east Africa have continued to thrive and spread. Inland, the past centuries have seen farming and fishing, and mining and craft, techniques improving all over central Africa. Communities were specializing more, in such activities as mining, metalwork and hunting, a development closely linked to the expansion of trade. Late Iron Age populations grew, and the remnants of hunter-gatherer peoples were squeezed more and more into deep forests (pygmies) or dry deserts (San). In the Lakes region, small chiefdoms have been emerging. In grassland areas, cattle herding has become ever more important, particularly in the south; this too has favoured the formation of chiefdoms. The Leopard’s Kopje culture is the product of warlike and chiefly pastoralists, with strong trade links with the Swahili cities of the Indian Ocean coast. 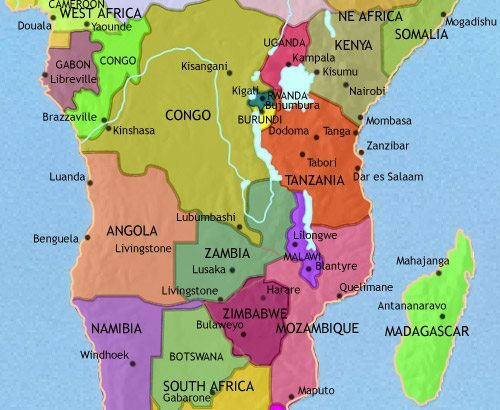 Its final flourish comes, at about this date, with the transition to the Great Zimbabwe culture, with its large, stone-built settlements anchoring a sophisticated, hierarchical society. 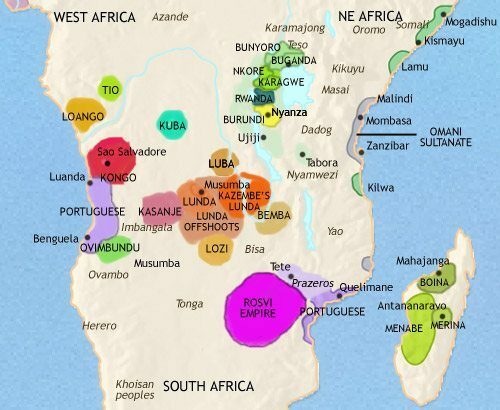 This period has seen kingdoms appearing in different parts of central Africa. Some of these are linked to the continued expansion of the trade routes from the Indian Ocean. 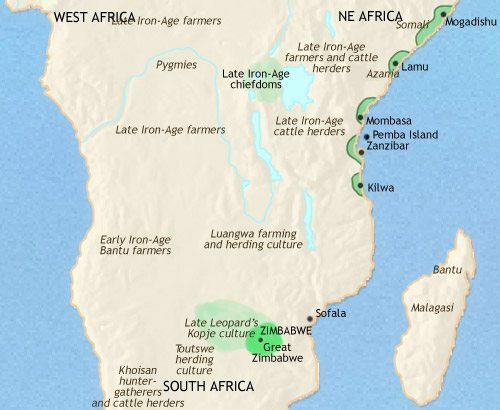 Most notably, the inhabitants of Great Zimbabwe have benefited greatly from their control of the gold trade down the Zambezi Valley to the coast. After flourishing for several centuries, however, Great Zimbabwe is abandoned at around this time. New centres of trade and power are coming to the fore, centred on the town of Ingome Ilede and the Mutapa kingdom. 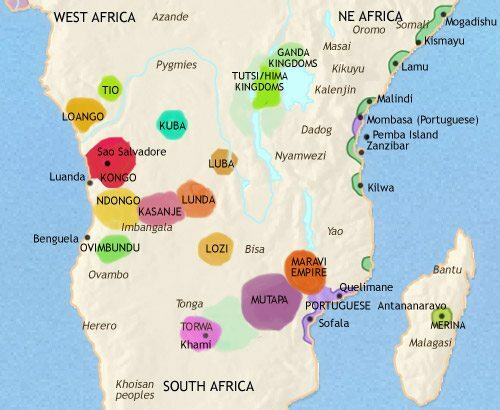 The Luba people of the Congo forest fringes have organized an important kingdom (c. 1400), and other kingdoms have emerged elsewhere – Kongo, the Ngondi states, Kitari and the small Ganda kingdoms. At this time, the pastoral Masai people are beginning to migrate southwards from their homeland in present-day northern Kenya, and on the Atlantic coast, the Herero have adopted the cattle-keeping economy and are moving into the dry grasslands of Namibia. The spread of American maize and cassava is leading to population growth, and has boosted the process to state formation in central Africa. 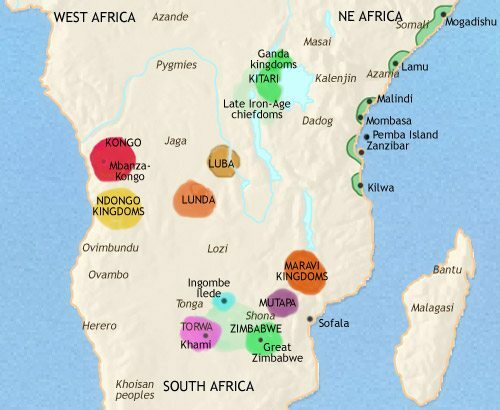 Kingdoms modelled on the Luba state (and in some cases offshoots of it) have appeared amongst the Lunda and the Maravi, the Imbangala (Kasanje) and the Lozi. 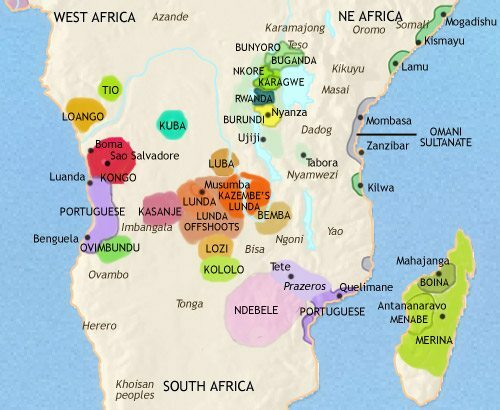 Other kingdoms – Loango, Tio and Kuba – have been formed in areas of dense population within the vast Congo forests; and Tutsi and Hima pastoralists have established their rule over states in the Lakes region. On the Atlantic coast, a new factor in central African history has been increasingly felt since the late-15th century, European demand for African slaves. The slave trade routes are gradually extending inland. 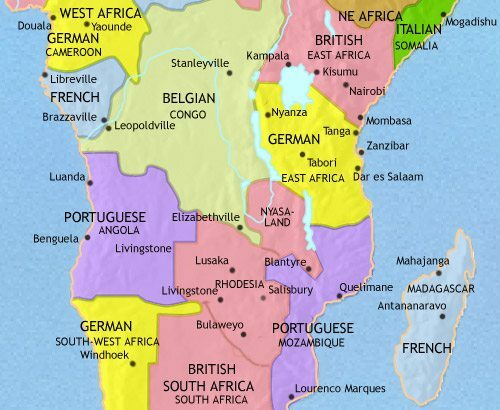 Europeans have also made themselves felt on the Indian Ocean coast, where Swahili states have been attacked – and some occupied – by Portuguese. The powerful kingdom of Matupa has blocked Portuguese penetration of the interior. Further north, the Masai are arriving in their modern homeland, while the Kikuyu have begun moving into theirs from the north east.